Machi ja bhajia is an East African Ismail dish. 5. Mix everything, let the mixture cool a little. 7. Grease another tray with oil spray or oil and brush. 11. Place in the oven and bake for 20 - 25 minutes or until brown. Yummy... Salmon is so good! that looks awesome..must b a delightful treat 4 fish lovers..
looks like a veg Tiki:) After long time here. nice to visit! Hi Sharmi, nice to see you again. I do visit your blog now and again. Love it. 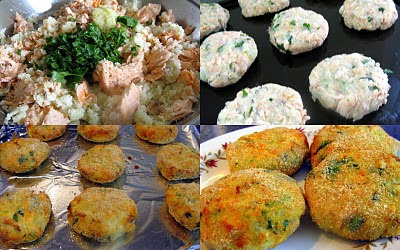 Yes the fish cakes do look a bit like veg tiki, probably because of the potato. So tempting fish cake. Thanks for visiting my blog and i should say you have a wonderful blog here. Can I use canned salmon instead for this recipe? If so, how much do I need to use? two 200 gm cans, drained.